As you develop a taste for the good stuff, i.e. high quality chocolate, you’ll probably notice that you eat less chocolate. That’s because the better the chocolate, the more satisfying it is. 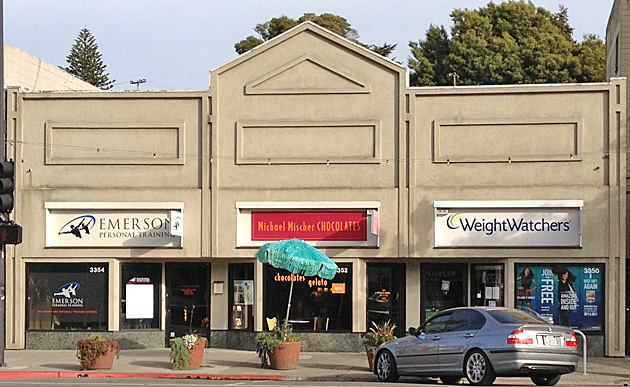 So while your first glimpse of the storefront of Michael Mischer Chocolates might cause you to chuckle — it’s sandwiched between a Weight Watchers office and a personal trainer — you will realize that it isn’t out of place at all. This place is good for you. One healthy block of Grand Avenue in Oakland. 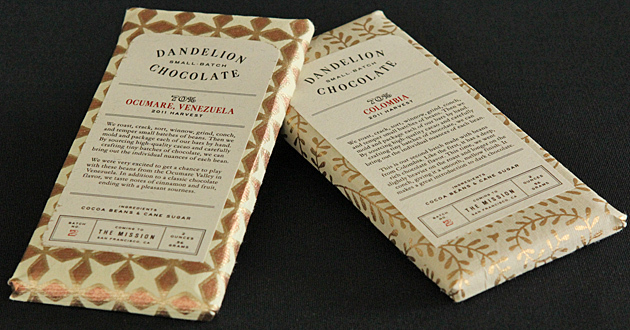 Michael Mischer Chocolates are made of Criollo cocoa, the rarest and most expensive cocoa in the world. This makes for some expensive chocolate (3 oz. bars are around $11), but you’ll be savoring it 2 bites at a time, so a bar will last a while. It really is that good — and it has tons of health benefits too, so enjoy it with a clear conscience. I am currently enjoying their 72% with cacao nibs and the 65% with blueberries & dragon fruit. The cacao nibs are finely ground, which makes for a crunchy, but not too crunchy topping. Cacao nibs can be quite hard, so the fine texture makes for a pleasant sensation that doesn’t interfere with the intense chocolate taste of the bar. The fruit bar is good too, although dragon fruit is not a very strong flavor. I admit I haven’t noticed it yet above the chocolate (but I still have a ways to go before the end of this bar). I also bought some of their filled chocolates that I am looking forward to: Apple Pie, Peanut Butter, Root Beer & Barbeque. (I’ll update when I’ve tried them, but it might be a while.) They also have a range of more traditional tastes, most in dark chocolate, some in milk. UPDATE: I’ve tried the Peanut Butter and Root Beer chocolates. The PB is a caramel filled chocolate, too light on the peanut butter for my taste. The Root Beer, on the other hand, is amazing. I know, it doesn’t sound like it would work, but it has a real root beer taste plus a good chocolate taste. You taste both, one dominant, then the other, and the root beer taste lingers afterwards. If you like root beer and chocolate, I highly recommend this candy. 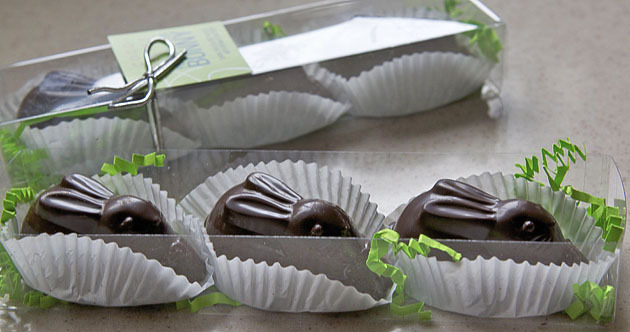 If you worry about this fitting your budget, you can buy filled chocolates by weight instead of in boxes, which saves some $$. Plus they have some small bars for $4.25. You’ll have to visit the shop, these offers are not available online. 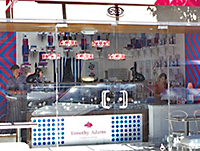 The shop is worth the trip for these deals, plus they have gelato and hot drinks. Hours are 12-9 pm M-Sat, 12-7 pm Sun, so you could hit the Saturday Farmers Market, catch a movie at the Grand Lake Theater, and/or dine at one of the local restaurants before stopping at Michael Mischer for coffee or dessert and something to take home. 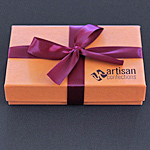 Michael Mischer Chocolates , 3352 Grand Ave., Oakland, 510.986.1822. Date posted: October 31, 2011. This entry was posted in East Bay chocolate, Local chocolate, Recommended chocolatiers, Review and tagged Apple, artisan, cacao nibs, coffee, criollo, dark chocolate, dragon fruit, espresso, gelato, Michael Mischer, milk chocolate, Oakland, peanut butter, root beer. Bookmark the permalink.